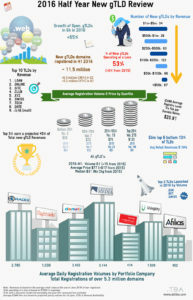 Registration Volume Scorecard of new Generic Top Level Domains as of August 23, 2014, there are 370 delegated new gTLDs. 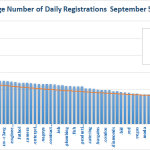 .XYZ has the highest average daily registration volume with 4,970 registrations per day (a decrease of 983 compared to two weeks ago). 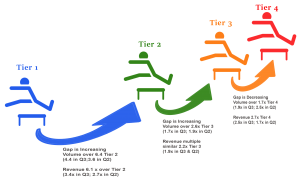 .BERLIN continues to downward trend from 1,042 to 993 and now 887. Both of which offered free domains increasing their numbers which is difficult to compare to other TLDs who only have paying registrants (see previous post from August 8th). .REISE which was at the third spot during the last period is now at position 72. It has been replaced by .CAREER which has just launched with 836 registrations followed by .HAMBURG with an average of 780 daily registrations. .CLUB remains consistently strong with 686 registrations (down from an average of 746 daily registrations). .WANG is still one position below .CLUB with 620 (a decrease of 21 per day). 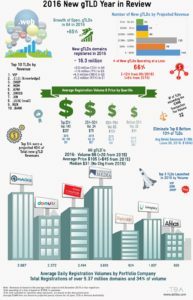 .BIO launches into general availability with an average of 415 daily registrations. While .GURU has an average of 334 per day (a small decrease of 23 over the prior period). .TOYKO is also enters general availability with an average of 277 registrations per day along with .LINK with 258. Overall, the average daily registrations of new Top Level Domains for the top half of all registries is approximately 178 (down from 204). However, if you eliminated .XYZ (the abnormality) from the top half, the average per registry falls to 129. 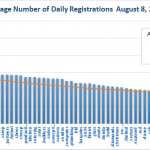 The bottom half daily average number of registrations is 21 (a small change of 3 when compared to the prior period).